A children’s room is a place in which they can feel most comfortable; an environment in which they can play, dream and explore their own creative mind. And many parents are now adding to their child’s private world by having wall murals painted on the bedroom walls. Wall murals that are designed uniquely for kids can empower a sense of wonder in children of any age. Parents across Denver are working with the creative team at G.Go Decorative to design wall murals in their home for their kids to enjoy. 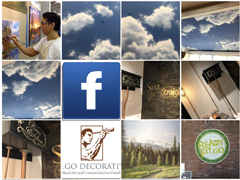 G.Go Decorative is a professional mural painting and faux finishing company located in Denver. The company’s attention to detail in their designs is second-to-none in the marketplace. Their intricate paintings and murals now grace the homes and businesses of hundreds of clients across the region. In addition to their range of subtle to intricate murals that are created uniquely for each client, one of the reasons so many are now choosing the company for their decorative needs is that G.Go Decorative offers an unparalleled working process that is driven by the client. Before any work has begun on their property, clients will be able to see how their finished product will look through a digital photo. It’s a cutting-edge service that combines the company’s talent for artistry, painting and graphic design. The G.Go Decorative specialists are known for the superior quality of their wall murals for kids. The company works with clients to help them carry out their creative vision for their child’s room. They also offer their own personal creations for those parents who are looking for a bit of inspiration in creating that one-of-a-kind environment for their young loved ones. The most common themes the company uses within their work are dinosaur murals, Disney murals, space murals and animal murals. But creative inspirations can derive from anywhere! The company is also known for their superb business murals. These artistic creations allow business owners to build their brand in their own personal image through the use of unique wall murals that capture the imagination of all visitors to their offices. It’s the ideal service for small companies beginning their growth in the marketplace and without a strong brand identity already associated with their name. It’s a service that offers the potential for businesses to build highly professional reputations that drive their brand forward for many years to come. The G.Go Decorative team is now offering each client direct insights on how to enhance their property’s atmosphere through decorative painting with a free expert guide. This free guide is directly available on the company’s website. Clients simply have to input their information to receive their personal decorating guide. Transform your home or business into a truly breathtaking work of art. Whether it’s a child’s room, a living room or a business office, the wall murals designed by G.Go Decorative can transform spaces into engaging, vibrant environments where creativity can thrive.